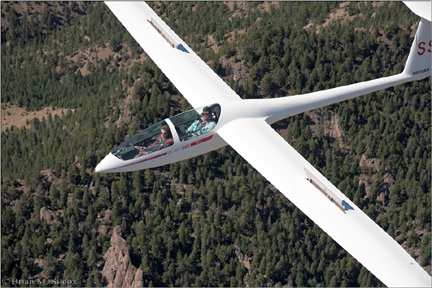 The best way to find out more about the SSB is to visit the glider side (north) of the Boulder airport located on Independence Road. We usually operate every weekend and some weekday afternoons. By all means, feel free to stop by the field on any active day and introduce yourself. You can join the SSB at the airport or by attending a SSB Monthly Meetings. When you join the club you will receive a complete new member package outlining the SSB procedures along with documentation for each sailplane in the fleet. If you prefer to join at the monthly meeting the SSB New Member Coordinator will be available to answer your questions about the club. Please contact the if you have any questions.